Tang yuan (sweet rice balls), sometimes we call it tong yuan (tang yuen), is a very traditional Chinese snack eaten at different times of the year, such as during the Spring Festival, Winter Solstice, or for the Chinese New Year; and it is traditionally shared to celebrate a close family during these celebrations. Especially during these celebrations, it is easy to find ready-made tang yuan in the supermarket, so why should you make tang yuan yourself? It is also a pleasure to be able to make traditional holiday foods with family. And homemade tang yuan is sweeter and more delicious., not to mention the satisfaction from the accomplishment. 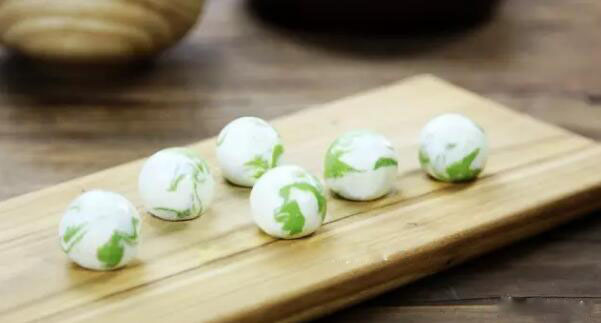 You may think that tang yuan is difficult to make, but follow the steps below, and you will see that it is pretty easy. This recipe that I have constructed is soft and smooth, and can also be stored frozen to save for whenever you have a craving for it! This recipe has two colors of dough and has an appearance of jade that looks very pretty. The green dough uses spinach juice, and the white dough doesn’t, it’s that simple! Step 1. First we will make the black sesame filling. Put the cooked black sesame into a food processor and grind into a powder (Don’t mix for too long, or it will turn into a paste). 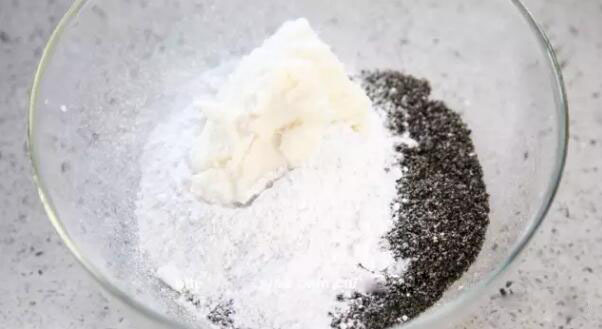 Without a food processor, the black sesame seeds can be placed on the table top and crushed with a rolling pin, but the powder will be more coarse. Step 2. Add powdered sugar, black sesame powder, and lard together into a large bowl. Step 3. You can mix all these ingredients together by hand. Step 4. After the mixture turns into a dough-like texture, you can put it in the fridge to firm up a bit. Step 5. Portion into 5-6 grams balls. Put it in the refrigerator to firm. Step 6. Next, we will make the dough. Put 50-60 grams of fresh spinach into the food processor, then add the same amount of water as the spinach, and mix into a fine spinach juice. Step 7. 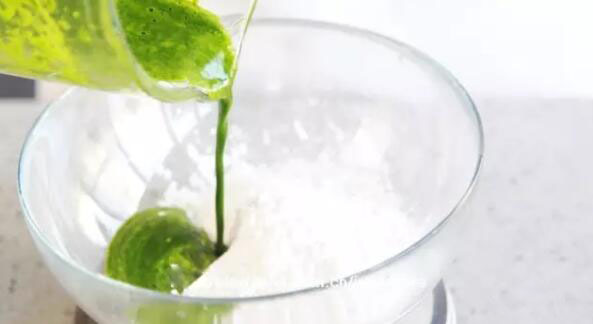 Put 100 grams of glutinous rice flour in a large bowl and add the 95-100 grams of spinach juice (do not add spinach juice all at once, add slowly whilst mixing). Step 8. Knead into a soft dough (because every bag of flour is different, may need to adjust the spinach juice amount so that the dough isn’t too sticky or dry. You can fine-tune your dough by adding a small amount of water or flour). Step 9. Pour 200 grams of glutinous rice flour into another large bowl, add about 190 grams of water (also adjust the amount of water according to your situation), and knead into a dough. Step 10. First, roll the white dough into a long strip, then roll the green dough into a long strip and lay next to each other. Step 11. Rotate and gently knead the dough so that the two colors of the dough are slightly mixed together (do not mix too much, if the two colors of the dough are fully blended, there is no clear pattern). Step 12. After mixing, portion the dough into about 13-gram protions. Step 13. Take a small piece of dough, roll into a ball, and flatten it in your palm. Step 14. Put a ball of the black sesame stuffing, and wrap the dough around it. Step 15. Use this method to wrap all the tang yuan. The wrapped tang yuan can be placed in the refrigerator for setting, and then stored in a freezer for later use. It can also be cooked directly. Step 16. The method of cooking tang yuan is very simple- boil a pot half full of water, put into tang yuan, and then boil for 4-5 minutes. Once the tang yuan have all floated up and you can fish them out and serve! 1. The ratio of lard and sugar in this black sesame filling formula has been appropriately calculated. If you reduce the amount of powdered sugar or lard, you may not be able to make a soft filling, and the cooked stuffing will be dry. If you don’t have lard, you can use softened butter instead (the filling will have a buttery aroma), but you can’t replace it with vegetable oil. 2. The amount of water in the glutinous rice dough must be controlled, not too dry, otherwise the dough will fall apart easily. Also not too wet and too soft. Please adjust the amount of water to achieve a suitable texture. 3. If you do not have a food processor, you can use a little green food coloring instead. 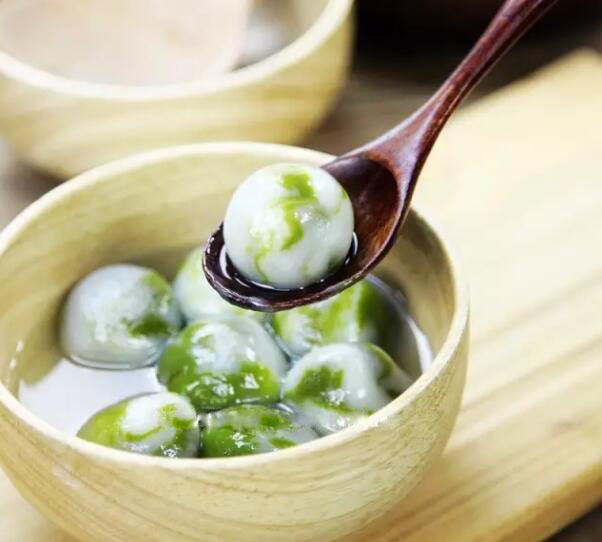 Or do not make green dough, just use glutinous rice flour with water and white dough, you can make an ordinary white tang yuan.